I enjoyed the book because It was exciting and was a really nice book. It was about a boy called Harry who rescues a little kitten and named it Little Houdini. Harry takes it to the RSPCA and will keep him there until he can find a home; a few days later he receives a letter saying he has to give him to Sir Winston Churchill for his birthday. Harry loves the kitten and wants to keep it but his dad won't hear of it. You will have to read this book to find out if Harry gets to keep this adventurous little kitty! One of my favourite characters in this book was Harry because he is a really kind boy who will do anything to keep this kitten. I really like the part in the book where Harry had to cycle with the kitten to Chartwell and met a man called Ned who told him a story of him meeting Sir Winston Churchill as a boy. I think the history about the war and Winston Churchill in the book is realistic. I really liked the book and it has made me want to read other animal books by this author. The book was about a boy called Harry, he rescues a little Houdini he wants to take it home but his dad won't let him. One day he hears that the cat is going to be a present for Winston Churchill, he also realized that Winston liked marmalade cats. I liked that Winston likes marmalade cats because there are my favourite as well. My favourite part was when the adventurous marmalade cat got rescued. The characters were Winston Churchill. There is Houdini Harry Sir Winston Mr Jenner old Ned Grace. So Harry rescues a kitten from a pipe and he bring it to the RSPCA centre but Houdini was a present for Sir Winston but now Harry really wanted to keep him but it wasn`t allowed of his father but his dad met Houdini then it was allowed and Sir Winston got another marmalade cat that was called Nelson. I read a bit of how Sir Winston won the battle in II World War. It is a fun book to read. I would want my sister to read it. I really enjoyed it because it is interesting. It didn`t have any pictures only a cat. Winston and the Marmalade Cat is a great book and I really enjoyed reading it. Harry loves working at his local animal centre. Little Houdini is a tiny marmalade kitten in need of a home. Harry wants to keep him but his dad would not allow him to. Then Harry learns that Little Houdini is to be a birthday present for Winston Churchill. Will Harry ever get to keep Little Houdini? My favourite event was when Harry met Winston Churchill. The history in this book was very accurate because Winston Churchill really was the Prime Minister during the Second World War. This book made me want to know more about this time in history. This book definitely made me want to read more books by Megan Rix. The story is about a cat called Little Houdini that got stuck in a pipe and a boy called Harry rescued it. He took it to the R. S. P. C. A. and Harry's job is to deliver it to Winston Churchills house in Chartwell for his birthday. But Harry wants the cat as his own pet. Little Houdini got lost in Winston's house but Harry found him. It turned out that it was meant to be a different cat for Winston's birthday, so Harry does get to keep Little Houdini as his own pet. I enjoyed the story of Winston and the Marmalade Cat. My favourite character was Little Houdini because he was so adventurous and very easy to picture. My favourite place in the book was Chartwell which was where Winston Churchill lived and it sounded like the best place to live. I think the history in this book is not realistic. Now that I have read this book I definitely want to learn more about this period in time. I enjoyed the book and it makes me want to read more of Megan Rix's books. Harry is a character that I liked because he was determined to get Little Houdini to be his pet. I enjoyed the book because it was easy to picture and they used a good variety of language and it was written in a style I liked. There was no part of the story I didnt like! It is very interesting and in the book it said that this boy called Harry finds a marmalade cat and he wants to keep it but his parents won't let him. The prime minister guy wants a cat which is marmalade and when Harry heard that news he knew that it was the same cat which he found up a pipe so he took the marmalade cat with him when the pet person Mr Jenner wasn't looking and told him his parents said no which was true. So when he got home he ran into his room he remembered that when he got trained in the animal place they told him that the animals should always be some food in their bowl because they can't tell you when they're hungry. This book is fantastic. I haven't quite finished it yet but the story is so interesting that it won't be long. A poor little kitten gets separated from its family and is found by Harry who takes him to the RSPCA. He is eventually chosen to be Winston Churchillâ€™s cat but I haven't got to that part yet. I loved this book so much I wanted to read it again when I had finished! In the book I loved Harry because he rescued pets and was brave. I am not sure if the history in the book was realistic. I kind of wanted to find out more about Winston Churchill but I already know quite a lot about him. I definitely enjoyed this book and recommend it to history lovers anywhere. As well as a story, this book has loads of facts about the war, and has a simple storyboard so that however much you dislike history, this book will always help you to understand.Â I loved the adventurousness of the little kittens and the sudden flashbacks.Â I have enjoyed this book thoroughly and am now interested in other books by this author. I have very much enjoyed this book and I would recommend it to all ages. I found this book amusing because it holds a lot of real facts and it is for children who are very nosy. It makes you wonder what is going to happen next as in the book there is a lot of sudden movement. I love the way the author added a quiz at the end of the book and I would definitely read another book by Megan Rix She also added fun extracts as well making the reader more intrigued and makes the reader want to get to the end. Not only is it a book, within the book there is a recipe for scones and a factfile on Winston Churchill. Also, it holds a lot of powerful text that emphasises the content very much. I like how it features several characters adding more and more as you go along. This makes your prediction of what is going to happen next changeable. As well as more characters, following the introduction of a new character is a story. For example, after Ned was introduced, the book follows with a story of how he met Churchill.Â In my opinion, I would recommend this book to fascinated learners. I would rate it 9 out of 10. I really enjoyed the book, as it is set after the war and one of the characters is Sir Winston Churchill himself. The description in the story was terrific, I really felt like I was actually seeing what was going on in the story. The history in the book was very realistic, and accurate too. I really love history, but reading this book made me want to find out more about the life of Winston Churchill, and his fondness for animals. I would really love to read some more books by Megan Rix, as her books are set in different historical periods, and are based on pets. 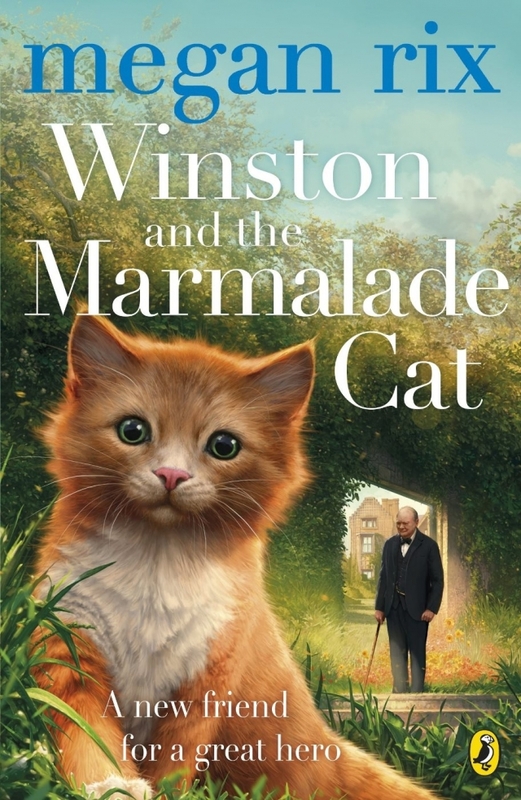 I really like the ending to the story, because Harry has met Sir Winston for the first time at Chartwell House and Harry's dad gets a job helping out in the garden with the help of Old Ned as well, and instead of Winston getting Little Houdini, the Marmalade Cat, Harry gets to adopt him instead, because Winston gets Jock another marmalade cat. I also really liked the flashbacks for Rufus, Nelson and Winston and Ned. I disliked the fact that there was a lot of missing vocabulary, but apart from that, I really loved the book, and would want to recommend it to another person. I enjoyed the book because I liked the way that they used the real Winston Churchill instead of a random Winston. My favourite part was when Harryâ€™s dad said Harry could keep the marmalade cat. I would want to read more books from her because from what I have read from her she is a really good author. My favourite place is the pipe because it was quite mysterious and my favourite character is the marmalade cat because he has cute, ginger fur. The book made me want to find more about History because it had Winston Churchill in it. I really enjoyed the book because it had lots of historical events including World War 2 and a little bit about World War 1. I thought the history in this book was quite realistic because it has a lot about the Prime Minister of England at the time of World War 2. It also had some facts about what his pets names were and what his life was like when he wasn't the Prime Minister. He got a lion and and an albino kangaroo for his birthday! The main characters are Winston Churchill, Harry and the marmalade Kitten called Little Houdini. Harry - who is nine years old - loves working at his town's RSPCA centre because he loves animals. One day, he rescued a little muddykitten from a pipe in the ground and it was a marmalade kitten. Then he wanted to bring him home, he was so adorable and excitable, Harry loved him. But his dad wouldn't give in. When Harry finally learns about he must be a gift for Sir Winston Churchill's birthday, Harry sneaked Little Houdini - the marmalade cat - home. He finally comes around and goes to Winston's house but Little Houdini runs away because of a dog. Then, Harry meets Ned - a friend of Winston's - and he finally got into Winston's house but he wasn't there, he was in London reting his broken leg. Harry and Ned went into the manor and Wnston's assistant was holding a little dog. Little Houdini jumped out of Harry's arms and raced away. After hours of looking, Harry finally found Little Houdini but there was Mr Jenner. Mr Jenner told Harry he could keep Little Houdini as Sir Winston already had a cat. From that day on, Harry loved having Little Houdini at home. I like cats so that helped. I also know about the war from lerning at school, so I liked the book. There is a cat that gets rescued and the boy wants to keep him. He is a gift for Winston Churchill but it didn't work out because of a dog and then Winston Churchill had a cat already. I liked that the main character Harry met different characters in the book and it was all about the cat. He was a good chracter to have and he really cared about the cat. There were some things about Winston Churchill that I didn't get but because I know a bit about the war. I would recommend it to children from about 8 years old and for children who have pets or want them. This book that I chose to read is called Winston and the Marmalade cat by Megan Rix. I have enjoyed reading this book because the cat is so cute! The history in this book is interesting because I don't know much about Winston Churchill. In this book however it does tell you where Winston Churchill lived which was Chartwell and that he was Prime Minister in the 2nd World war. This story is about a young boy called Harry who likes helping out at the local RSPCA centre. One day when Harry was about to leave school one of his teachers came rushing out of the building and said to Harry, 'A small cat has got stuck in a pipe!' Harry followed his teacher to the pipe, he rescue the cat and took himm to the rescue centre. The cat was covered in mud so he gave the cat a bath and he realised it was a marmalade cat. One of the workers at the rescue centre said the cat had to be a birthday present for Winston Churchill. The next day Harry had to cycle all the way to Chartwell. 10 minutes later a man called Ned said there already was a marmalade cat so Harry was allowed to keep it.